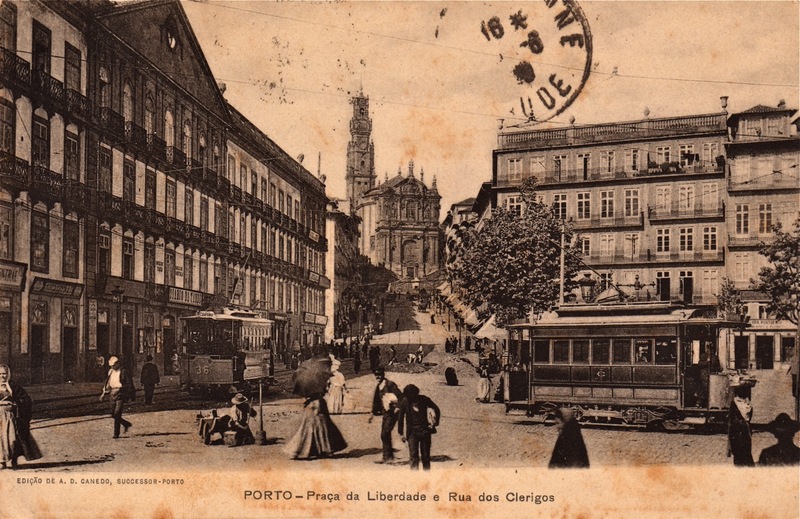 This postcard shows tram 18 on Praça Dom Pedro IV and two other trams, the first likely 10, in Rua dos Clerigos. 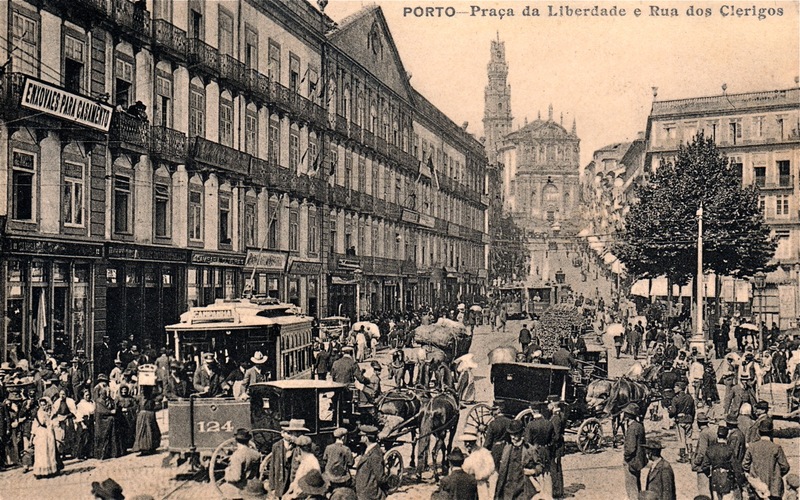 Although the postcard says Praça da Liberdade, which means it was printed after 1910, the photo is from quit some years before. The tram at the left has the number 36. The fleet numbers of the trams were raised in 1907 by hundred. 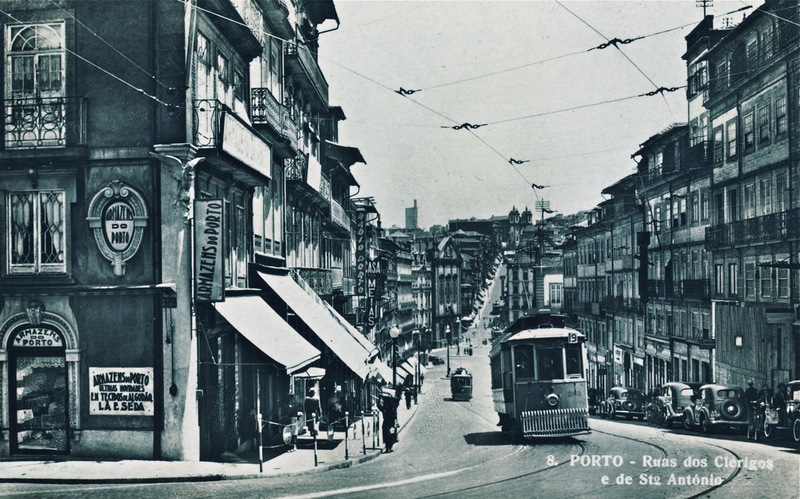 Photos showing a Porto electric tram with a number below 100 are not taken later as 1907. Tram 36 was in 1902 converted from a mule tram to an electric tram, which means 1903 is the earliest year this photo can be taken. The number of the tram at the right is alas hidden by a lady with a basket on her head. This tram has a BSI truck and might be one of the three trams build new in 1898/9 by the workshops or a former mule tram / steam tram trailer converted to electric tram about the same period. 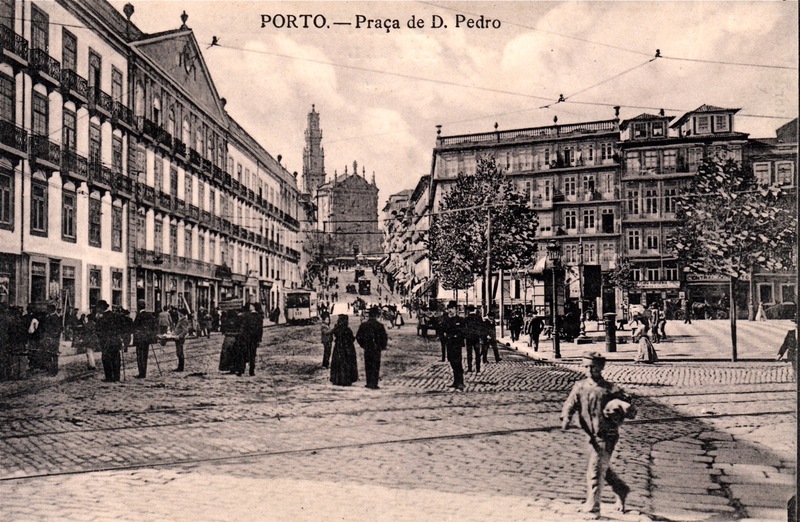 At the left is the Palácio das Cardosas and in the background the Rua dos Clerigos with the church and tower of that name. This stereo photo shows tramcar 46 with in the background one of the two open trams 41-42. Tramcar 46 was build in 1904 by the local company A Constructora and in 1906/7 reconstructed by the workshops into a 7-window car getting the number 201. 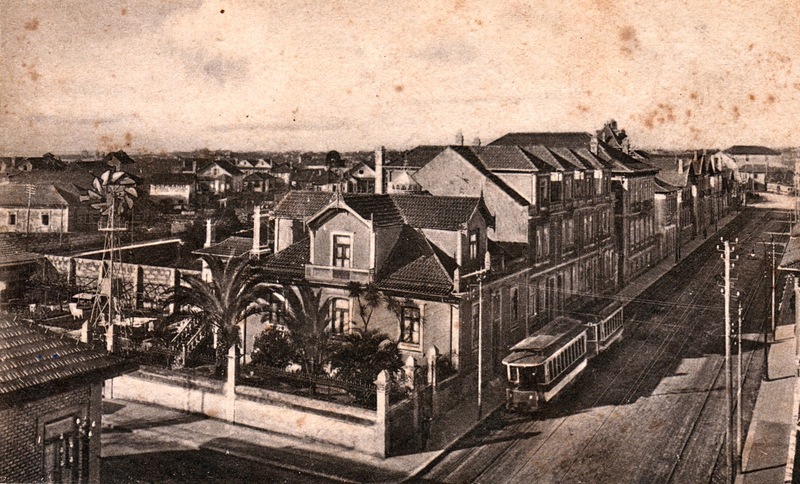 The trams 41 and 42 were in 1904 converted by A Constructora from mule trams to electric trams. 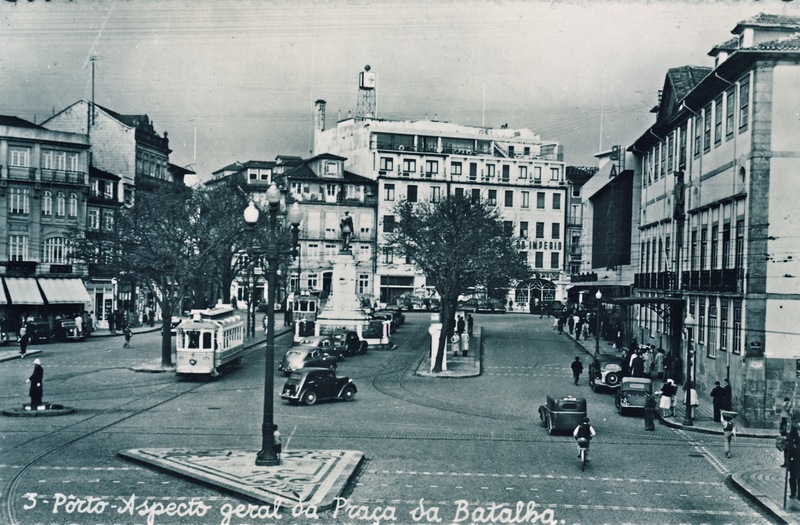 The photo is taken on Praça Dom Pedro IV, since 1910 Praça da Libedade. A Brill-23 tram hauling trailer 9 arrives at Praça da Batalha. The tram came as line 14/ from VN de Gaia and will continue as line 9// to Ermesinde. 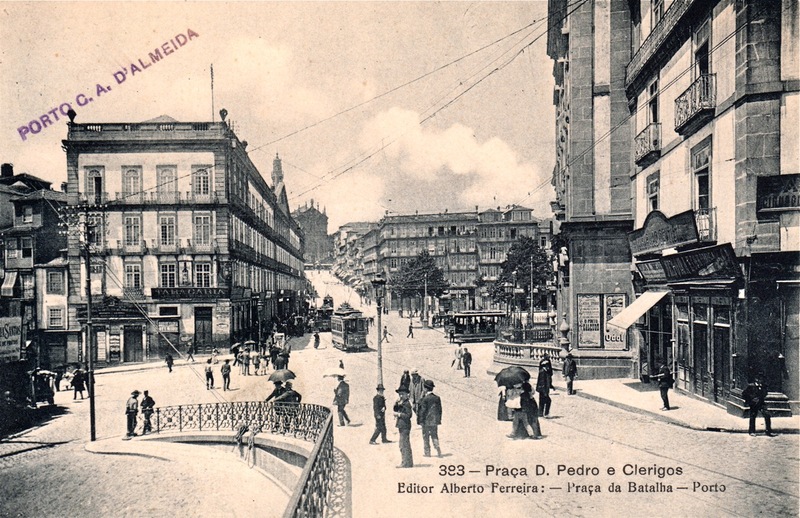 A Brill-28 tram on line 17 arrived from Foz on Praça da Batalha. 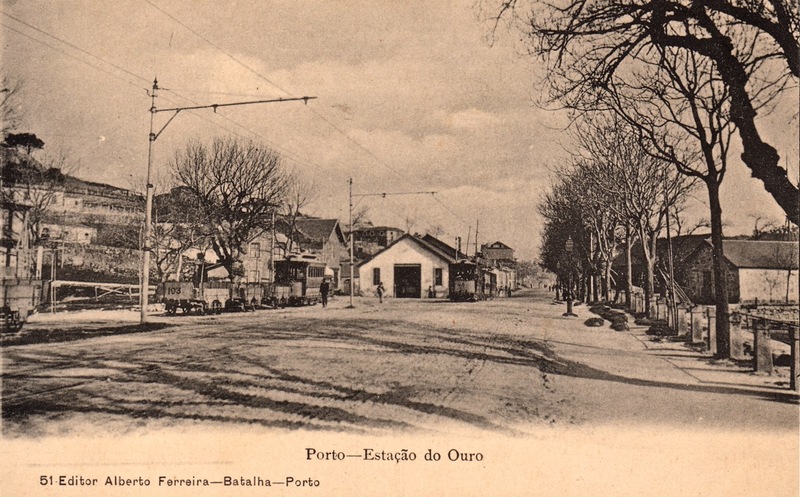 This was the depot of the Companhia Carril Americano do Porto á Foz e Matosinhos. Tram 2 with two trailers is approaching. At the left another tram with three freight trailers. 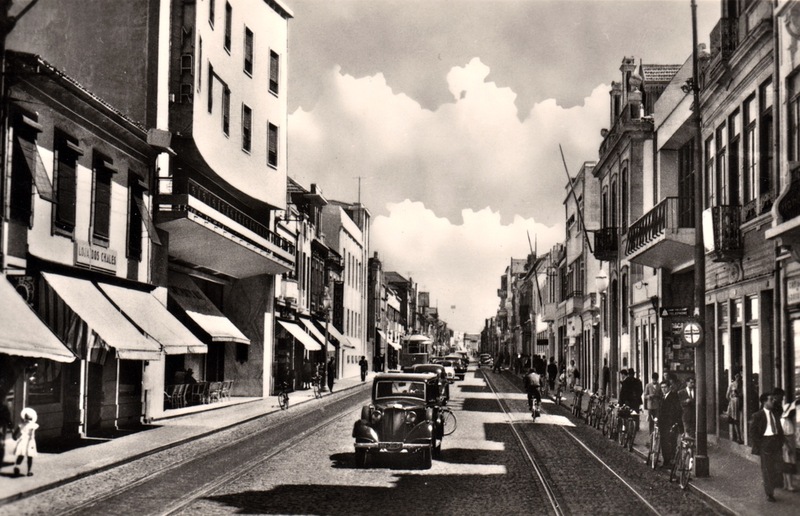 This photo of around 1950 is taken in the northern part of Rua Brito Capelo. The street has now the typical layput of tram tracks at the sides next to the pavements and cars parking in the middle. A Belga tram is heading north. Remarkable are the many bicycles parked at the curb. They were kept standing by putting the right pedal down on the curb. 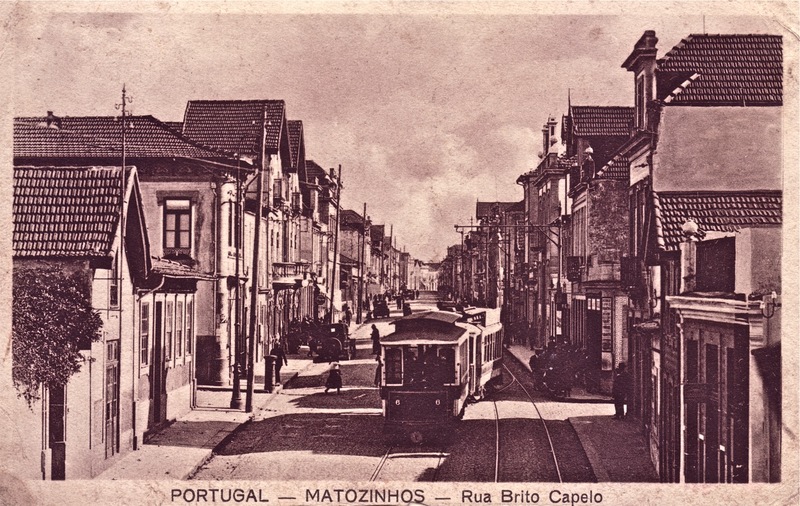 A Brill tram with bogie trailer 6 leaves the passing loop in the northern part of Rua Brito Capelo. 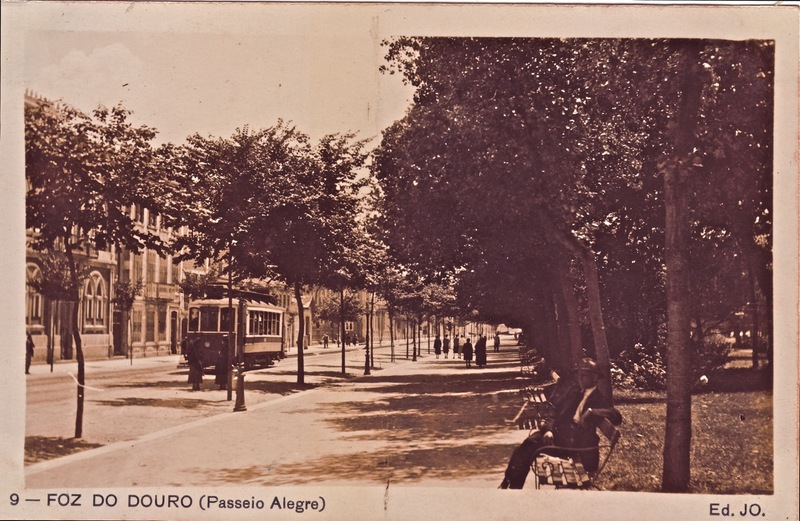 This part of Rua Brito Capelo had single track until 1930. A Brill tram with a bogie trailer heading north. This part of Rua Brito Capelo has already double track. The tram has no fenders, so the photo was not made later as 1926. In the background at the right is another Brill-tram + trailer combination in the curve between Rua Godinho and Rua Thomaz Ribeiro. A Brill tram on Passeio Alegre. The tram has already fenders, which means the photo was not taken before 1926. The rule of way is still left, which means the photo is taken before 1 june 1928. Tram 201 on Avenida do Brasil. This is one of the 7-window A Constructora of 1907. The tram already got closed platforms and has the resistances on the platform roofs, which proves it had new electric equipments. The tram does not have fenders. This tram lost its number in the second half of 1926 to a bogie tram. The new number however is unknown. Fumista 299 is almost at the bottom of Rua dos Clerigos. This tram was renumbered by the STCP to 315 and now part of the museum collection. Brill-32 tram 253 is almost at the top of Rua dos Clerigos. 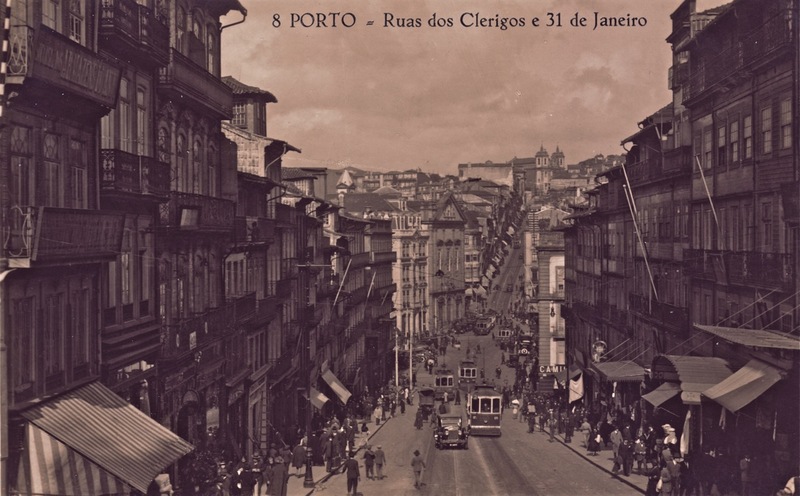 The name of the street in the background, Rua de Santo António, shows that the postcard was produced in or after 1940. 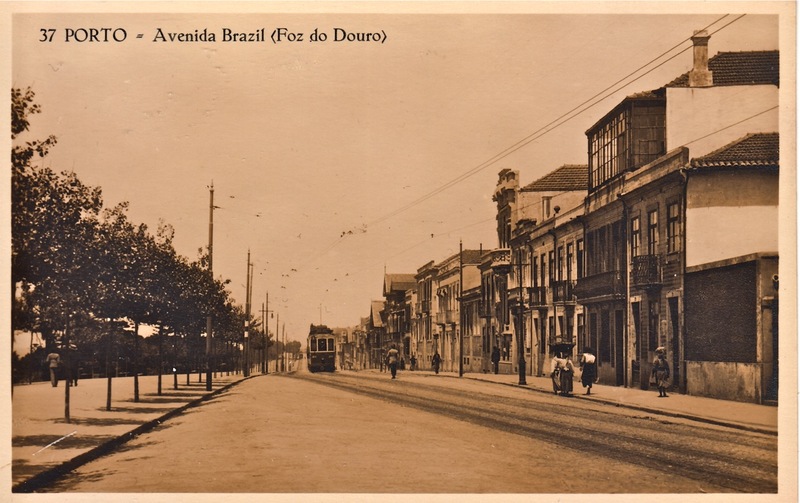 Between 1910 and 1940 this street was called Rua 31 de Janeiro, a name it has now again. The postcard was used in 1948. Busy trafic with many trams. The rule of way is still left but the trams have already fenders. This places the photo before 1 june 1928 but not before 1926. 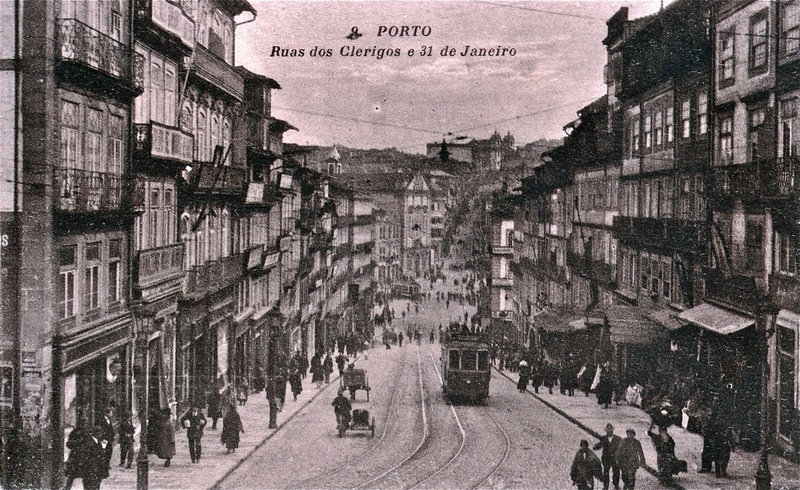 This is a rather grainy picture of Rua dos Clerigos with a Brill tram. The photo is likely taken in the early 1920’s as the tram has not yet fenders. A Brill tram of the 1909 order passes the university building. The rule of the way is still left, which places the photo before 1 june 1928. The tram has fenders, which proves the photo was not taken before 1926. 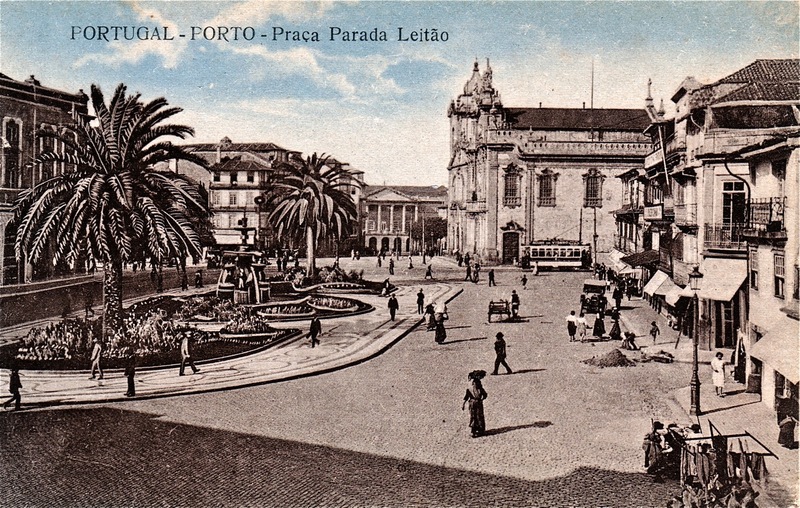 This postcard shows the name Praça Parada Leitão, which in fact is around the corner at the left. 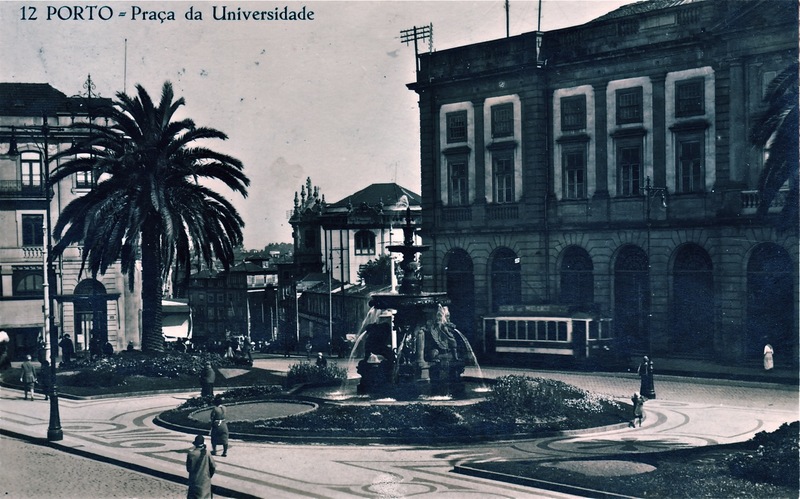 On the photo is Praça da Universidade, until 1835 known as Largo do Carmo and later as Praça dos Voluntários da Rainha. 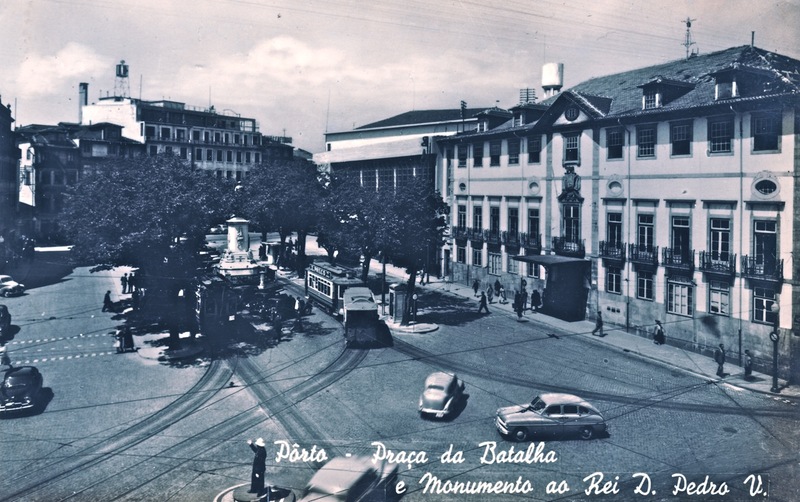 Since 1936 it has the official name Praça de Gomes Teixeira, but it’s unofficially also known as Praça dos Leões. Most often this place is called Carmo. The University building is at the left. In the background is the Hôspital de Santo António and at the right the Carmo and Carmelitas churches. 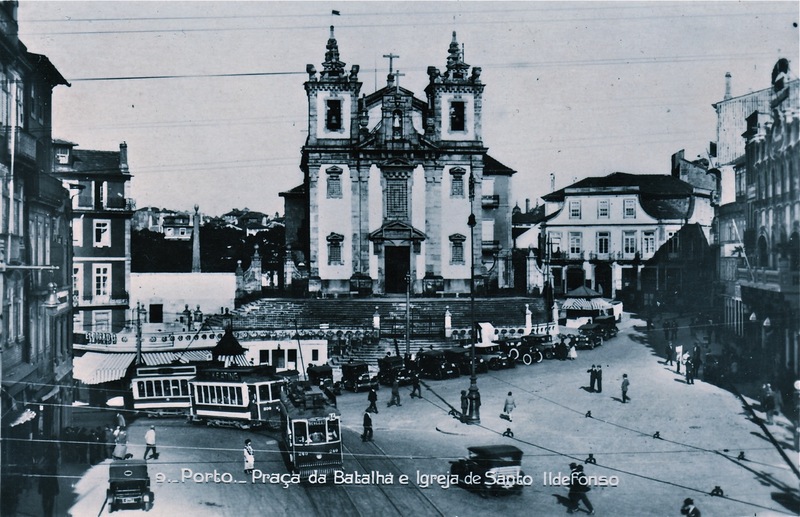 The Carmo church is just passed by one of the three A Constructora trams build in 1907. It has still open platforms and a second trolley-pole for working across the Ponte Luís I to VN de Gaia. 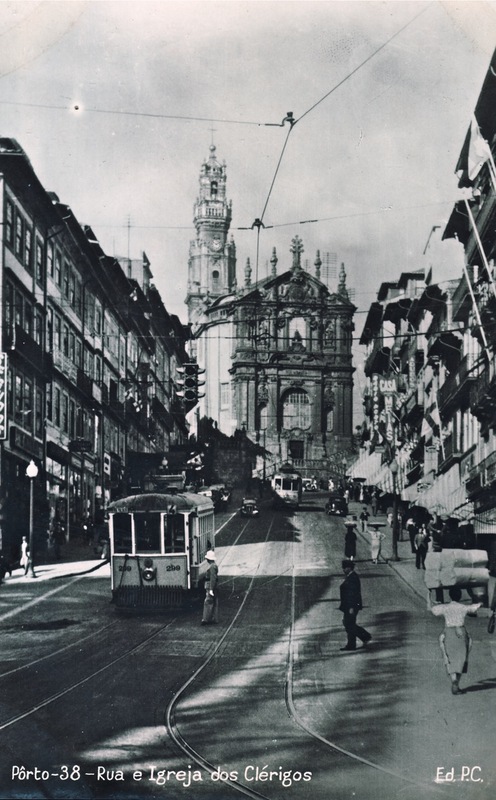 Busy tram traffic in front of the Igreja de Santo Ildefonso. The rule of the way is right, which places the photo after 1 june 1928. Tram 249 working on line 14 is on the way to Devezas. I’s followed by tram 239 working on line 17, which has almost reached its terminus. Tram 249 is of the Brill-23 type and has a second trolley-pole for crossing the Ponte Luís I. Tram 239 is of the Brill-28 type, in this case made by widening a Brill tram of the 1909 order. Number and exact type of the third tram cannot be determined, but it looks like a Brill-23 of the 1910 or maybe 1912 order.